June 6. 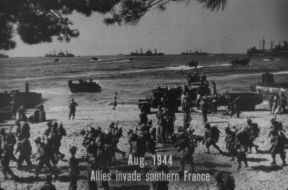 1944, sees the great Allied invasion of France and the establishing of beachheads all along the Normandy coast. 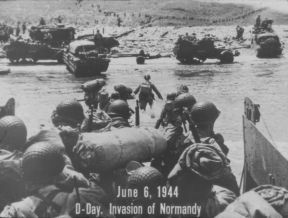 Here, American troops pour out of an assault boat and wade to a beach already secured. Southern France is invaded in August. 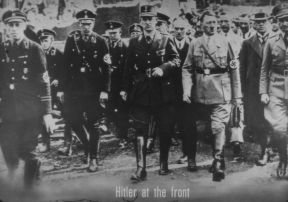 with little opposition from German forces already weakened by the pressing demands of the Normandy and Russian fronts. On August 25. 1944. 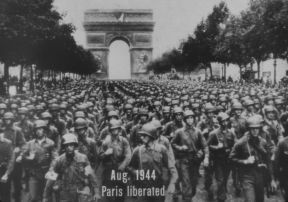 Paris is liberated and American troops in battle array and ready for instant action march through the Arc de Triomphe. After a lightning sweep through France and Belgium. infantrymen of the 90th Division are among the first Americans to invade Germany. 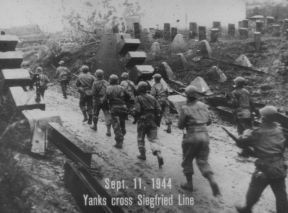 moving in through the concrete dragons teeth of Hitlers vaunted Siegfried line north of Trier. 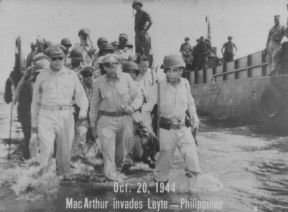 General Douglas MacArthur who sold, I will returnl when ordered by President Roosevelt to escape from Corregidor in 1942, makes good his promise on Octaber 20, 1944. On December 21, 1944, the great Battle of the Bulge begins and Von Rundstedts armies score a temporary success. A German film captured by the U. S. Army Si,gnal Corps shows a grim-faced Adolph Hitler inspecting bamb destruction in a recaptured German town.